Well that didn’t take long. Megan Duffy is the new Marquette Coach. I think that you will like Megan. And that one article said that the AD was at ND, so he may know her from there and that sped things along. Seems like a good hire! Agreed! When I stupidly thought that the new Purdue AD would care about the program, she was on my short list to replace Versyp. I was surprised by the hire, even though I was impressed by the way she turned Miami's program around in her two years there. But the success she's had has come about almost completely with the players she inherited. None of the five freshmen or two sophomores she recruited averaged even 2 ppg or 2 rpg this season, with the exception of one freshman who played in only 9 games before being lost to injury. How well she can recruit is certainly open to question at this point. Also, the RedHawks faded at the end of this season, losing 5 of their last 7 games after leading the MAC for much of the year. They lost first round WNIT home games in both of Duffy's seasons there. So I would grade her body of work at Miami as incomplete to date. She may turn out to be the next great young coach, or she may be the next Sylvia Crawley. Duffy arrives at Marquette after leading Miami (Ohio) to a pair of Women's National Invitation Tournament appearances during her two-year tenure with the program. Miami finished the season with a 23-9 overall record and a 13-5 Mid-American Conference mark in 2018-19 and reached 20 wins in back-to-back seasons for the first time since the 1980's. Yeah the AD mentioned today that he knew Duffy from his time at ND. I switched around my schedule a bit and headed to the press conference today. It was a nice turnout which was good to see. I also liked seeing all the returning players there (no guarantee they'll all stay though I know). I got a chance to briefly meet her after the press conference and introduced myself as a long time crazy fan . She'll be busy now trying to contact the 8 recruits that Kieger had signed for 19-20 although one of them is from Australia and enrolled at Marquette in January so she was at the press conference today. One fun thing I found out today is that they're working on putting a video scoreboard at the Al - have been wanting to see that there for awhile. Fun fact (credit to Anonymous Eagle for this) - the Big East now has 3 head coaches who were assistants under Kim Barnes Arico either at St. John's or Michigan (or both in Duffy's case) - Megan Duffy at MU, Melanie Moore at Xavier now who was an asst. at Michigan and Joe Tartamella at St. John's. Megan is a class act. I think you will really enjoy having her there. So, any chance Nell hires Holly? Anybody heard anything re: Missouri State's replacement process? Nope - wonder if Jackie Stiles is interested though. It's such a domino effect obviously with the coaching changes. I was feeling bad for Miami now having to find a new coach after Duffy left there to replace Kieger. Megan Duffy would have been great for Purdue! 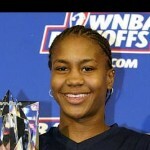 She is from the Dayton (Kettering) Ohio area, and played PG at Notre Dame. It should be noted that Duffy accomplished this during a time when the MAC has been a very good basketball conference. In 2017-18, both Central Michigan and Buffalo made the NCAAT Sweet 16. In 2018-19, CMU, as the #9 seed, lost by one point to #8 MSU in the first round, while Buffalo, as the #10 seed, upset #7 Rutgers before succumbing to #1 UConn in Storrs, 84-72 (and Buffalo rallied to make it a game, trailing by eight points with 2:41 to go). Now, would she have had enough experience (in the mind of the AD/administration) as a HC for a program like Purdue, which has a rich and storied history? Maybe, maybe not. But -- and I do not mean disrespect to Purdue -- the Boilermakers have not been a factor on the national scene in a decade. After two Elite Eights in 2007 (her first year) and 2009, Sharon Versyp has not made it past the NCAA Second Round since. And her teams have missed the NCAAT three times in the past five seasons, not to mention that her teams have only finished in the top five in the Big Ten once in the last five years. Purdue, like Duke, has severely fallen off the national scene. Purdue, like Duke, hired someone who was the former HC of Main (Joanne P. McCallie was Maine's HC from 1992-2000; Versyp was Maine's HC from 2000-2005). Purdue, like Duke, has an AD who backs his women's basketball coach, despite the downward trend of the program. But congratulations are in order to Marquette, which gets a young, up-and-coming coach who has proven that she can do an immediate turnaround of a program and develop players at a mid-major school in a very good conference (MAC). While Marquette loses at LOT to graduation, Doug Bruno/DePaul and rest of the Big East should watch out for Duffy. I hope that she knows what she is getting into! The weather up there can be brutal in the winter. Snow and wind and cold! That north wind coming off of the lake can bring in lake effect snow falls in the 2' range with no problem! Hofstra welcomes back Danielle Santos-Atkinson as head coach. Was most recently the associate head coach at Pitt. Her coaching career started at HU, as an assistant. Isn't she also a Hofstra alum, or not? The tweet made it sound like she was. Missed posting that Cleve Wright (former Miami OH HC) was named Gannon HC. He was at Eastern Illinois last few years as AC.